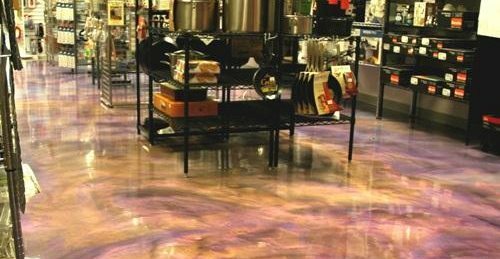 Blending a spectrum of stains and dyes, this epoxy overlay showcases purple in all its royal splendor Project submitted by Don Pinger, Custom Concrete Solutions, West Hartford, Conn.
How do you color a floor purple? The key on this project was combining just the right blend of colors and putting them down on the right base color. Using a black-pigmented base brought the semi-transparent Reflector colors to life. They were also enhanced with some dye to really make them pop. Despite its complexity, the entire project, completed in May 2010, took only 7 days, from start to finish. The existing concrete floors in the "Everything for the Kitchen" supply store in Glastonbury, Conn., had a full pantry of problems. "The floors had just about everything wrong with them," says Don Pinger of Custom Concrete Solutions. They had two different types of carpet glue and mastic on them. They had linoleum tile in certain areas that had been covered with mastic and patching compound, and paint and grease in other areas. There were deep trenches and large popouts left from numerous iterations of businesses over the years. We went in with our large grinding machines with 25-grit diamonds and went to town. It took two full days to get all the mastic off the floors and begin patching." 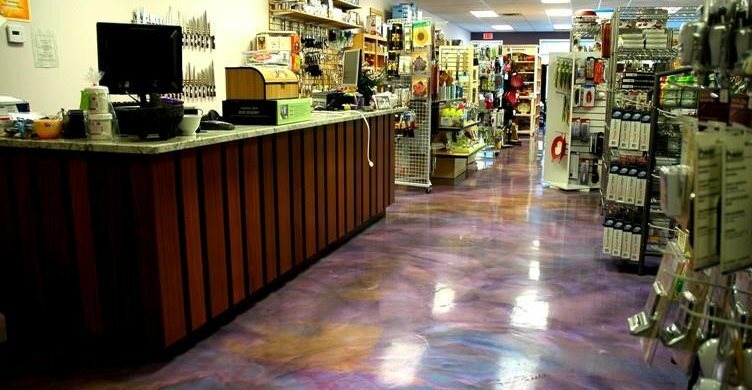 The store owner contacted Custom Concrete Solutions after she had seen an eye-catching salon floor the contractor had recently completed in a neighboring town, which featured an epoxy overlay with Reflector Enhancer metallic pigments from Elite Crete. "The owner wanted a floor similar to that one, but in a purple color scheme since nearly everything in her life is purple, including her car, her key chain, her nail polish and her clothes. She chose a few colors she thought would work, favoring the semi-transparent shades. My job was to see how they would work together, so we started doing mockups and samples to get the look she wanted," says Pinger. To make sure they achieved full color saturation, Custom Concrete tried various colors on multiple base colors. "We did white, black and purple. The black base really brought out the semi-transparent Reflector colors the best, enabling them to really come through," says Pinger. The floors were first primed with an epoxy mixed with a bit of Reflector in Gunmetal. Next, the crew applied six different layers of epoxy, each with various colors of Reflector additive. "We used Blue, Sky Blue, Sky Blue mixed with some blue dye, Violet, Red Purple and Red Purple with some concentrated metal dye added in." Getting down on their hands and knees, the artisans applied the different layers of epoxy with small Magic trowels, blending and swirling the colors thoroughly in some areas, and in other areas, letting the different colors stand on their own for more dramatic effect. To really bring out the shine and reflective finish, three coats of a super-high-gloss floor wax were applied. Custom Concrete Solutions specializes in using custom color blends and other special effects to embellish their work. Here's another recent project where they used their color wizardry to achieve a completely different look: Tanning Salon Floor Glistens Like Copper.